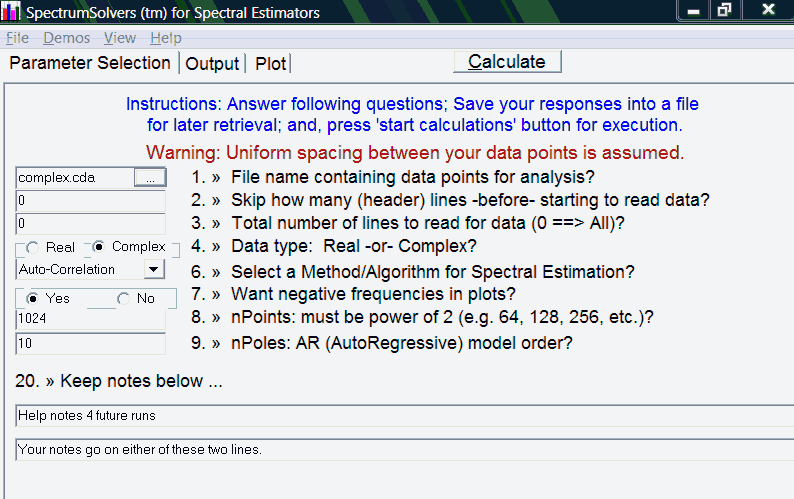 SpectrumSolvers 6.12 Free Download - Find best Spectral Estimation Method for a Power Spectral Density plot. Industry problems with solutions over the past twenty plus years have been put into a textbook to show the power of Calculus (level) Problem-Solving. The textbook is on our website at fortranCalculus.info/textbooks/ . The software architect behind Calculus Compilers is Joe Thames (read about Joe on our About page). Help improve science and engineering productivity by supporting Joe Thames' MetaCalculus University Rollout efforts, visit metaCalculus.com/campaigns.html, in developing MC Fortran. (There has been little if any corporate funding of Joe's work for many years!) Help future science &amp; engineers get jobs upon graduation. With MC Fortran, one increases their productivity by a factor of twenty! Please visit our textbook at fortranCalculus.info/textbooks/ and help support Calculus level compilers at metaCalculus.com/campaigns.html. Thanks!